No Frigate Like a Book: Why "Secrets of the Red Lantern" AND "No Man's Land"? Why "Secrets of the Red Lantern" AND "No Man's Land"? "You should read "The Sorrows of War", my husband said when I told him I was planning my 52-countries read for South East Asia. "I know we have it around here somewhere since I had to read it for college." So I did a cursory scan of the shelves, and even opened a few of the book boxes in the basement, but my heart wasn't really in the search; it was probably chucked, as were many of our spine-disintegrating paperbacks, during a post or pre-move purge. I hadn't really wanted to read a hallucinatory novel based on the experiences of a Viet Cong soldier anyway--I wasn't sure I wanted to read about the Vietnam War at all since I had memoirs of surviving the genocides in Cambodia and Burma/Myanmar planned for later during the month; and the Korean War; there's only so much unrelenting tragedy I can absorb before I become numb, or worse still, indifferent. So. I searched the web, but I couldn't find much fiction available in English that didn't deal with that conflict, and certainly nothing that written by a Vietnamese author. I'd actually hoped to read a novel set in French Colonial Indochine, and thought about selecting some fiction or memoir by Marguerite Duras, but I felt that reading "The Ten Thousand Senses" for Indonesia checked the colonial angst block for me. No more double choices on countries for me--I was never going to get out of Asia at this rate! Or so I thought. Pauline, her mother Cuc Phuong Nguyen, and her youngest brother Luke, her business partner and co-author. I thought it would be a welcome break from all the intense literature and memoirs I had chosen for South East Asia. Plus, after not having access to an Asian market for many years, I finally had the wonderful www.lotteplaza.com a short distance away, so I wouldn't have to compromise on ingredients, drive to another country (France, during my pork-and-potato years in Germany) for unusual foodstuffs, or skip an interesting recipe all together. Duong Thu Huong was the daughter of a Communist Party leader. At the age of twenty she became an entertainer in a Communist Youth Brigade; despite her non-combat status she was only one out of three survivors out of the original group of forty. She was deafened in one ear after a bomb exploded, killing the girl beside her. 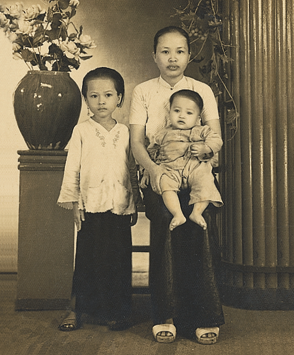 Later she was pressured into marriage and gave birth in the tunnels of central Vietnam. After the war, she returned to writing and producing screenplays for the Communist Party, but gradually became a critic of the repressive practices of the government. She was expelled from the Communist Party, imprisoned for seven months, and smuggled out her first adult novel, "No Man's Land" to a Vietnamese press in France; it was subsequently the first Vietnamese novel published in the United States. Her passport has been revoked, and her novels are banned in her native country. A more complete biography by her English translator, Nina McPherson, can be read here: www.vietnamlit.org.